First, the boom in mobile video, which demands far more capacity than previous mobile applications, is changing the nature of wireless data traffic. The millennial and post-millennial generations are consuming far more entertainment on mobile devices than their TV- and PC-bound elders. They videochat on FaceTime and Skype and send video clips on Snapchat and Instagram. Facebook’s new auto-roll video clips now begin playing without a click from the user, turning your newsfeed into a cascading video feed. And apps like Periscope allow celebrities, reporters (and anyone else) to stream real-time video from their phones to their followers. Meanwhile, the emerging Internet of Things — what I call the immersive Internet — is driving the next big acceleration in the volume of connected devices. The idea that most people on earth now have mobile phones is staggering. These billions of mobile computers far outnumber the connected devices of the earlier Internet era, PCs. As the world becomes saturated with 7 billion or so mobile phones, however, the immersive Internet will multiply that total several times over. In the next decade, we might connect 50 billion or so devices to the Internet — every car, watch, boat, shoe, package, shipping container, medical device, vending machine, camera, drone, you name it. But this is a very liberal and optimistic interpretation. Almost half of that 389 MHz is contained in a pilot program of spectrum that is to be shared between the government (specifically, the Navy) and the commercial world. The shared spectrum program is an important and useful idea, but it’s only a baby step, and it will take years to launch and refine. Another huge chunk — some 100 MHz — is “pending” a successful incentive auction of underused broadcast TV spectrum. But this auction, perhaps the most complex in history, has already been delayed several times. It is mired in complicated rules, litigation and now renewed efforts to reopen the already controversial rules. And of the new licensed spectrum actually cleared for commercial use in the last eight years, a single company, Dish Network, which has no mobile customers, acquired over half of it. In truth, we are thus far short of the 500 MHz goal. For the last several years, T-Mobile and Sprint, the third- and fourth-largest U.S. mobile firms, have argued for special set-asides of spectrum to help boost business. 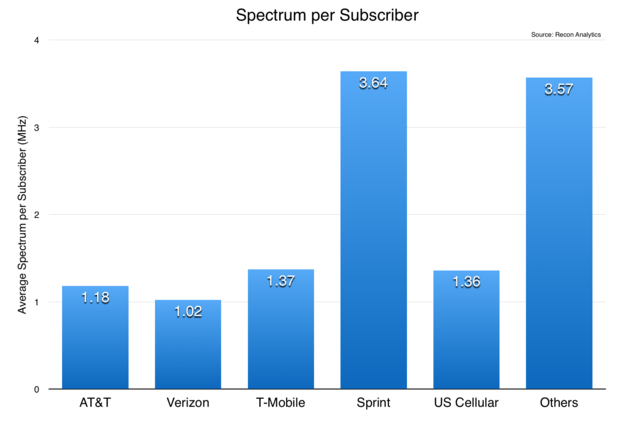 They’ve argued they are spectrum-poor compared to AT&T and Verizon, although on a per-subscriber basis they actually own more. In particular, T-Mobile and Sprint have argued that their relative lack of “low-band” spectrum in the 600-800 MHz range makes it difficult for them to compete. Sprint and T-Mobile, which own most of their spectrum in the mid- and high-bands, said low-band spectrum is more useful because of its greater coverage of broader geographic areas. They successfully lobbied the FCC to tilt the incentive auction rules in their favor, making it more likely they will obtain low-band spectrum at discounted prices than in a free and open auction. The record-setting sums bid in the AWS-3 auction early this year demonstrate conclusively the value of mid-band spectrum. In fact, Goldman Sachs says the $41 billion AWS-3 auction was a game changer. It “reset our understanding of where value is stored within the sector,” Goldman writes. “The valuations bid for these ‘mid-band’ frequencies were not only more than 2x what we had expected, they flipped on its head the conventional wisdom that low-band ‘coverage’ spectrum is the most valuable.” Not only is mid-band not orphan spectrum, it is perhaps now the most valuable type of spectrum. Perhaps recognizing the fault in their spectrum-poor arguments, the smaller firms now argue that they deserve access to generous portions of all types of spectrum, even spectrum they declined to bid on in the past — and at a discount. But how far should Washington agencies go to take from some firms and give to others to erase any perceived differences among market competitors? We might as well just adopt a full-scale industrial policy, dispense with auctions and secondary markets altogether, and go back to command-and-control government spectrum allocations. The very reason for the incentive auction is to repurpose old TV spectrum that is now grossly underused precisely because it was parceled out by the government decades ago under a top-down, Washington-knows-best system. Ronald Coase, the father of spectrum auctions, is no doubt looking down in disbelief. A real auction is the surest route to achieving that 500 MHz objective — and launching the next waves of mobile innovation. Will the Apple-Samsung battle help modernize patent law?